A wonderful image of a remarkable bridge! 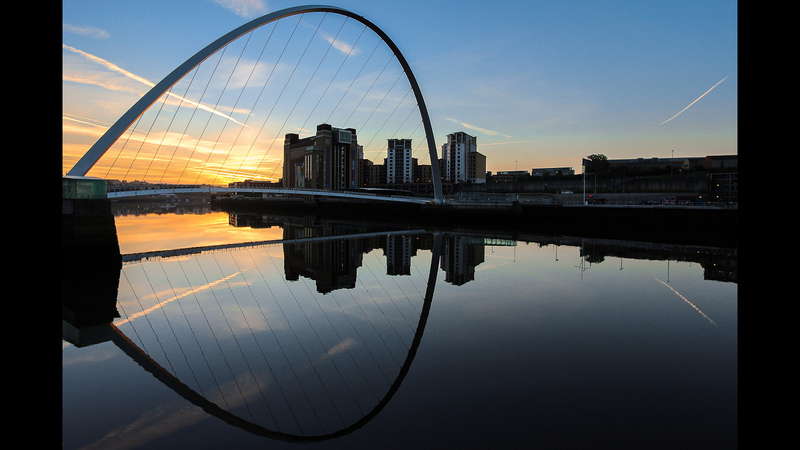 The Gateshead Millennium Bridge (also known as the Baltic Millennium Bridge) is located over the Tyne River between Gateshead and Newcastle, UK. The bridge is technically a cable-stayed arch bridge. It is the world’s first rotating bridge, designed to pivot to allow large boats to pass underneath it. The bridge, designed by Wilkinson Eyre Architects and Gifford and Partners (structural engineer), was created to merge into the environment, and the photo clearly reflects (all puns intended) this effort.